Sometimes the most nondescript seeming plants are the most powerful! One of my favorite groups of plants is the Artemisia species, with over 50 subspecies. Most look a bit scrubby and unkempt, although a few have become garden cultivars. Look for slightly hairy, gray-green leaves with toothed margins. The growth habit is often woody or spreading. They all share a sharp sage or camphor-like aroma when crushed. Artemisia absinthium, native to Europe, is the plant used to make the liquor absinthe. Artemisia annua, native to China and now naturalized around the world, is a valuable anti-malarial plant. It is grown in cultivation to supply parts of the world with anti-malarial treatments. Many plants in this group also go by the common name Wormwood, indicating the ability to purge parasites, if used properly. In our mountains, we have two subspecies, both important medicinal plants. Artemisia douglasiana, also known as California mugwort, grows in canyons and meadows near a water source. 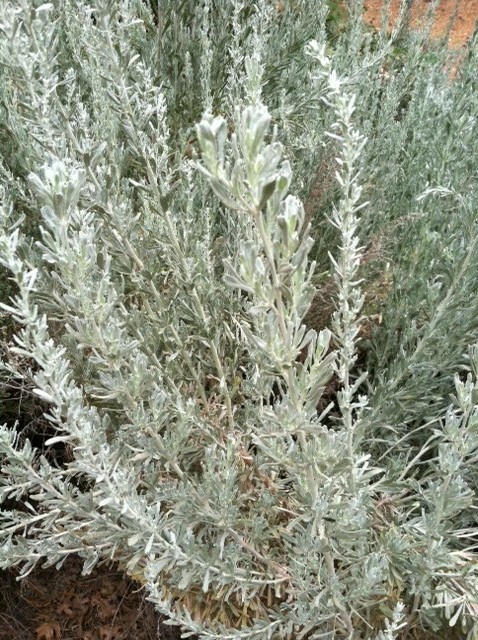 Artemisia tridentata, or Great Basin Sage Brush, grows in dry open meadows and along roadsides. There’s a typical specimen along Los Huecos Road on the north side about ½ mile from Sunrise Highway. Both these plants have been used as traditional herbal medicines by native peoples. The leaves were brewed into a bitter tea to treat colds and flu, as well as stop internal bleeding. This tea could also treat stomach problems or menstrual irregularities. A wash made from the leaves could be used to disinfect wounds. The branches were used in sweat baths. Artemisia was always avoided during pregnancy, due to its ability to bring on menstruation. Artemisia douglasiana is thought to stimulate vivid dreams. To use it this way, place a fresh or dried cutting of the plant near your bed. Some dream pillows include mugwort as well as other herbs like chamomile and lavender. Try it and see if it works. As with all plants, Artemisia shouldn’t be used internally unless you are working with someone trained in herbal medicines. These unassuming looking plants pack a powerful wallop and demand our respect. But the next time you walk by the Artemisia tridentata on Los Huecos Road, take a look and crush a leaf to smell the typical aroma. You’ll start to notice more and more of them as you walk our trails. Enjoy!